In the 18th century, Rome was the principal crossroads for the European community, and an important source of influence for French artists who rose to prominence in the Eternal City. This exhibition highlights the flowering of French art in 18th-century Rome, focusing on some one hundred works. 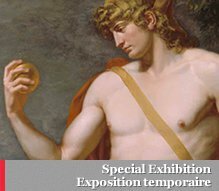 Visitors will have the opportunity to view an exceptional selection of drawings and prints as well as a number of paintings by many important French artists of the period, including Hubert Robert, Jean-Honoré Fragonard and Jacques-Louis David.Organized by the National Gallery of Canada in collaboration with the Musée des beaux-arts de Caen.